I’m purchasing an Xbox Live Indie Game every day, seeking out the quality titles that got lost in the shuffle and no longer appear in the top 50 downloads. Today is day #68, and today’s game is “Hexement”. 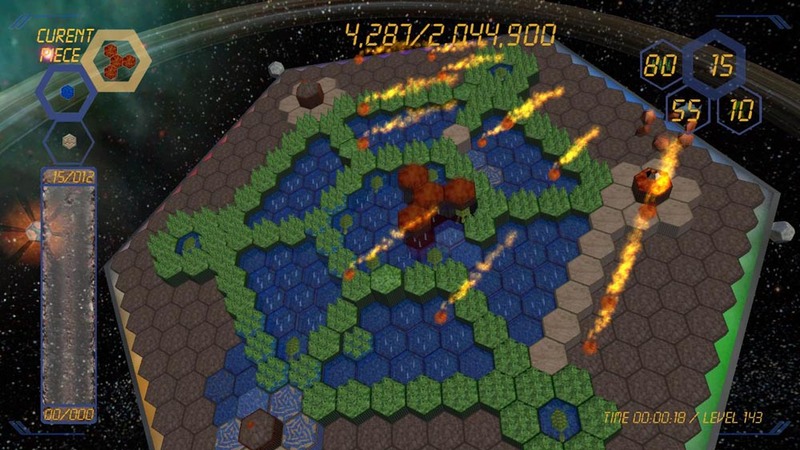 Hexement is a fascinating game, one that can be described as Tetris meets Sim Earth, and one that succeeds at being more than the sum of its parts. In Hexement you have a flat world balanced on Atlas’ shoulders. World building blocks (water, earth, etc.) fall down onto the world, and you manouevre them Tetris-style onto the board. You have to make sure that your world remains balanced enough (ie. that not too many of the world building blocks fall on any one side) that it doesn’t fall off of Atlas’ shoulders. You also have to make sure you’re dropping earth in the right places to make sure you’re retaining the water you need to develop life. Do this successfully, and life will begin growing on your world. The game is challenging, and introduces some amazing concepts that are definitely not like anything I’ve seen before. The game succeeds at blending its varied influences together into a complete whole. For only 240 Microsoft Points, you can own one of the most unique games I’ve ever seen. For a second opinion, check out Kobun’s review of Hexement. Know someone else who would want to vote? Click “Share This” above and invite them to. Great find, I’m really enjoying this game. I’m very glad you’re enjoying it. There’s been a good bit of overlap as expected between the games we both cover, but I’m always happy when I see something that I’ve missed and completely forgotten about. The scoreboard tells me I played Hexement long ago, but after downloading it again after reading this article, I have to wonder why I ever let it go. Hexement is a really good game, and, as you note, the developer inexplicable seems to have abandoned it. Seventh Gear barely has a web presence, and I can only assume that Hexement was hurt mainly by not being an attention grabbing title and being released in the first few months following Community Games’ launch in untested waters. It’s a real shame, too. Hexement deserves better status as it’s one of the best puzzle games on the channel. Didgery, another awesome puzzle game, hasn’t sold much, either, so I can also assume that the XBLIG market unfortunately isn’t much into puzzle games. I’ve had several people on Kotaku tell me they purchased it after my review, and hopefully the same will be true after yours. I added a link to your article from mine as well, as I always do when we review a game in common. This is the first time I’ve had to do so after mine went up, though, and I’m glad to have helped you rediscover the game.